It is not uncommon for ill/aged/troublesome dogs to get sent to a friend/relative in the country, where they are set free, and then shot. It’s cheaper than going to the vet, and the dog gets to have a final moment of blissful rambunctiousness before he is put down. It’s a euphemism for killing a dog, good sir. @all of the other commenters so far: I’m sure the blogger understands the maeanimg and joke of the graph. 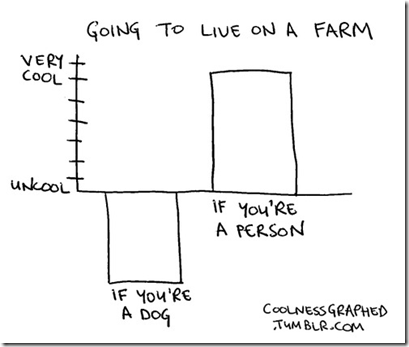 The reason for his comment isn’t because he missed the joke, it’s because according to this graph there are absolutely no instances of dogs going to live on a farm being cool when in reality there are. For the graph to be correct in reality there would have to be at least a little bit of coolness for the dog side as well. You guys missed that he was making a joke at the joke graph. @CS I’m pretty sure he just hadn’t heard that expression… I certainly hadn’t heard it. If we’re going to over-analyse: this illustrates the dangers of using a point average without analysing the underlying distribution. How uncool is dying for a dog? Very. How cool is genuinely living on a farm? Rather cool, but not as cool as dying is uncool. How many dogs die compared to how many dogs actually live on farms? Many times more. Those data points representing happy dogs on a farm are simply lost in the average. Now, if, instead of two bars showing averages, the chart used small-multiples tightly grouped bar plots with a common baseline showing the whole distribution across the x-axis for each group ordered from highest to lowest, you’d see this (as well as seeing that there are some unhappy/uncool humans living on farms and not enjoying it). This chart made no sense to me. I live in Wyoming. The blogger is right, dogs on farms here are the happiest creatures on Earth. I am a dog who lives on a farm. My people in the suburbs did not want me anymore so they sent me to live on a farm. Not to die or be shot, but to exist. I used to lie around on the couch, go outside to play ball, take rides in the car, get excellent medical attention… now I live outside year round and eat food from a huge bag. The old ‘Rover-went-to-live-on-a-farm-where-he’ll-be’happy-forever’ excursion happens but rarely these days, I would imagine, whereas there are always and will forever be many happy happy dogs on farms.